Bonnie Dundee, fair Scots city set back a little way from the chilly North Sea. Her reputation is there for all to see. She is the City of Discovery! and boast a large statue of Desperate Dan? Famously, it was sometime in the year 1883. In the river, a large whale the residents did see. It was big, noble, grey and black. But since that day, a whale, to the Tay has never come back. Tho’ it could be because they harpooned it in the back! on this second Friday in October 2010. The fog means no river can I see today. as the city of Paris with a Tower designed by Mr Eiffel. She’s as good if not better than others I can give mentions. Such as Copenhagen, New York, Berlin, London or Athens. Overseen grandly by the the fine Dundee Law! From Fintry to Lochee, the West End and down to Broughty Ferry. 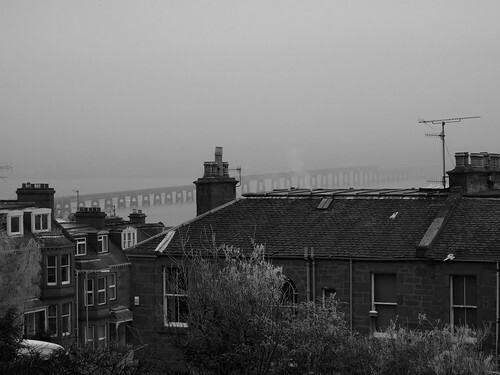 of the famous, Silvery Tay that flows into the sea. My poem was inspired by Dundee’s famous William Topaz McGonagall. 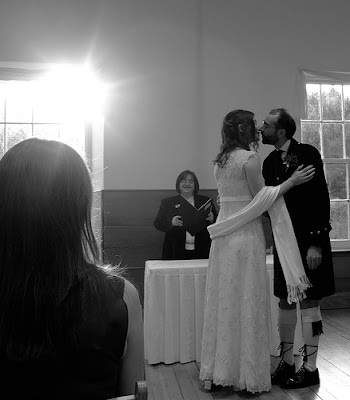 Here’s a snap that I took at the wedding of my former house-mate and accomplished etymologist (for the esteemed Oxford English Dictionary), Jane. Her and her husband Mike are currently in New Zealand, indulging in a bit of “tramping”. Another former house-mate, Rebecca was the bridesmaid and she can be seen in the pic in the left foreground. The wedding was held at the fascinating World Heritage site, New Lanark, which is south of Glasgow. They have restored the cotton mills and the other buildings that comprise the 19th century example of utopian socialism created by the noted social reformer and philanthropist, Robert Owen. He’s also credited as the “father of the cooperative movement and was the father of the US Congressman, Robert Dale Owen. Amongst other things, Robert Dale Owen drafted the bill that resulted in the formation of the Smithsonian Institute. The ceremony took place in the building formerly (and delightfully) known as the Institute for the Formation of Character. The lighting was pretty tricky as there was a strong yellow glow from the incandescent lights and also, the sunlight coming through the windows was constantly changing. Anyhow, the history lesson, lovely natural setting, kilts and dancing are captured in this Flickr set. Right nows it’s Burns Night, the de facto Scottish national day (night). No one seems to celebrate St Andrew’s Day as much as they do Burns Night…I could be wrong of course. Kate and I celebrated with a wee dram of the fine Speyside, single malt, Dalwhinnie. The past couple of Burns Nights we have celebrated by having a gathering where, veg. haggis, neeps and tatties have been consumed…along with several varieties of whisky. Last year, we combined the celebration of the life of Scotland’s favourite poet, Robbie Burns with a celebration of life and times of infamous Scottish “poet and tragedian”, William Topaz McGonagall. Being Australian, I also marked Australia Day, which is 26 January. Even as I type, it’s officially Australia’s national day. 26 January, 1788 was the day that the first British colonists arrived in Botany Bay. Hence, some people have taken to calling it “invasion day”. Some may accuse this nomenclature as being (overly) politically correct…however I think that there is definitely a logic in thinking about it like this. Anyway, I think it’s good that Scotland’s unofficial national day celebrates the life of one of their greatest literary figures and not some battle/massacre/victory etc. So, to the image that adorns the start of this post. TNT Magazine is a publication that has a large focus on the backpacker/working holiday/overseas experience markets in the UK. They cover some latest news from Australia, New Zealand and South Africa…mainly of the “what’s happening on the OZ/Kiwi/Saffa version of Big Brother” variety. Other than that, the rest of the magazine seems to be advertisements for companies that will ship your accumulated crap back to the Southern Hemisphere. They also have Australian and New Zealand editions of the magazine which I imagine work in reverse…target market, Brits on tour in the Antipodes. Having once been the target market of TNT Magazine UK, I do admit to having read the odd edition picked up for free from stands in London or from Bar Oz when there used to be one in Oxford. So a couple of weeks back on a trip to London, I flicked through a copy of TNT in a café in Southwark. Don’t get me wrong, plenty of ex-patriate Australians have class but I fear they might be outnumbered at the The Sports Café tomorrow night. Anyhow, this weekend I’m going to be at former housemate Jane’s (and Mike’s) wedding in Lanark in Scotland instead. Good luck guys.